Rewards Canada: May 28 Update: United Airlines to Kelowna, AC finally connects Toronto & Hawaii, we're giving away 5,000 Aeroplan miles! May 28 Update: United Airlines to Kelowna, AC finally connects Toronto & Hawaii, we're giving away 5,000 Aeroplan miles! Enter our Aeroplan dExclusives contest, United and Air Canada launch new routes and more! 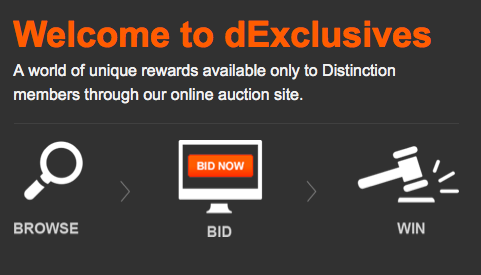 Aeroplan has launched a new Auction site for their Distinction members called dExclusives. These are exclusive auctions that you can bid your Aeroplan miles on, some are very cool and once in a lifetime opportunities like the FIFA World Cup package of 2 business class tickets, hotels and tickets to the semi-final and finals! We have a separate post discussing the new feature for Distinction members with a contest attached to it where you can win 5,000 Aeroplan miles for letting us know which auction you would bid on or would like to see in the future! Read more about dExclusives and enter our contest here! To celebrate the above mentioned new Air Canada Rouge route between YYZ and HNL, they are offering 20% off all flights to Honolulu from anywhere in Canada. The flights must be booked by Jun 10 for travel November 21st to April 30, 15. This is prime season for Hawaii, so if you can book this far out you should look into this offer. Just too bad Maui isn't included as it is on my list again for next winter! Find all the details of the sale here. - 500 Bonus Starpoints and Complimentary breakfast for two when you stay in a newly renovated room at the Sheraton Milwaukee Brookfield. More... Until ? - 500 Bonus Starpoints and Two drink tickets per stay when you stay at the Sheraton Milwaukee Brookfield. More... Until ?